The Coos estuary supports expansive eelgrass meadows but little quantitative eelgrass data are available. In South Slough, where quantitative data are available, eelgrass meadows appear to be stable and may be getting denser. Algae represent a substantial proportion of the biomass found in intertidal mud and sand flats. The historic abundance of algae in the Coos estuary suggests they’re established constituents of the tidal flat community, not opportunistic species responding to excessive nutrient levels. 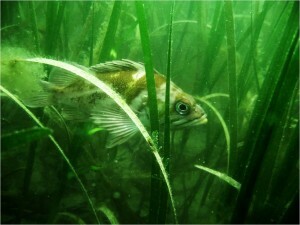 Copper rockfish swims among eelgrass blades. 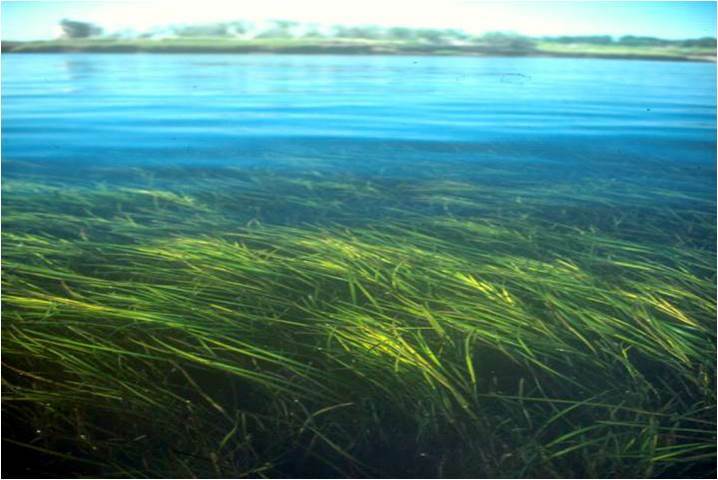 Two seagrass species are found in the Coos estuary: common eelgrass (Zostera marina)and dwarf eelgrass (Zostera japonica). Eelgrass meadows are found throughout the Coos estuary in intertidal and shallow subtidal waters, with the most dense seagrass beds occurring near the mouth of the estuary in the Lower Bay and South Slough Subsystems (Figure 1). In a 2009 assessment, the United States Environmental Protection Agency (USEPA) characterized the seagrass populations of seven Oregon coast estuaries (Lee II and Brown 2009). 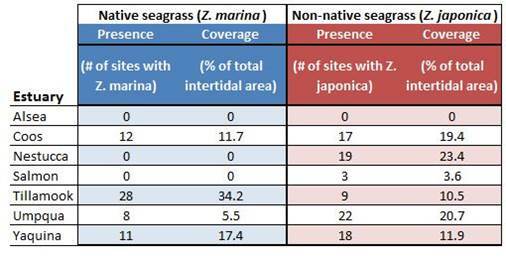 Their findings suggest that the native eelgrass (Zostera marina) is more abundant in “moderate to large tide-dominated estuaries” (e.g., Coos, Yaquina, and Tillamook)(Table 1). 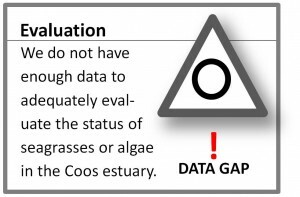 Their conclusions are corroborated by research in Washington, which found that estuaries with these same characteristics (e.g., Willapa and Grays Harbor) had proportionally large areas of suitable eelgrass habitat (Wyllie-Echeverria and Ackerman 2003). In contrast, an estuary’s tidal regime does not appear to be closely correlated to the distribution of the non-native dwarf eelgrass in Oregon (Lee II and Brown 2009)(Table 1). For more information about Z. japonica, refer to Chapter 18: Non-Indigenous/Invasive Species. 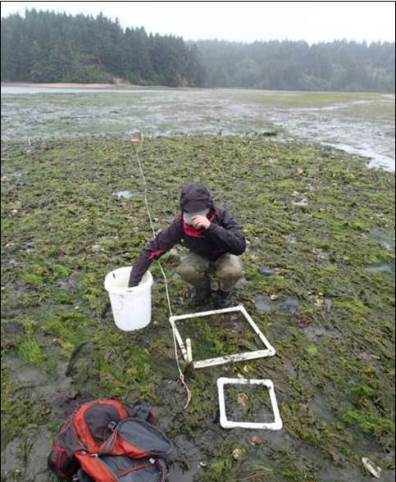 South Slough National Estuarine Research Reserve (SSNERR) staff have been monitoring common eelgrass meadows near Valino Island since 2004 as part of the SeagrassNet global monitoring effort (SSNERR 2015)(Figure 2). 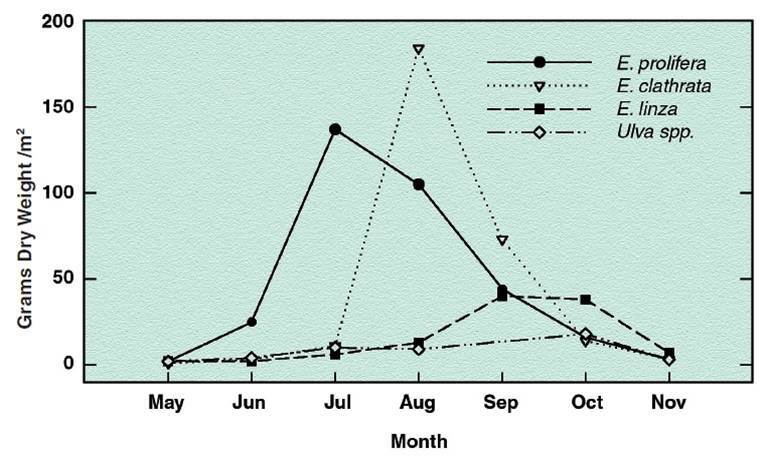 Monitoring results so far suggest that the spatial cover and stem density of the Valino Island eelgrass meadows change seasonally: spatial cover and density both decrease during winter months, when daylight hours are fewer and plants senesce (Rumrill and Sowers 2008). Spatial cover of the Valino Island eelgrass meadows appears to be stable, displaying a statistically significant (p< 0.01) trend of increasing density (shoots per m2) over the past 10 years (Figure 3)(SSNERR 2015). Eelgrass percent cover and canopy height, however, do not appear to have changed significantly since 2004 (p = 0.56 for percent cover change; p=0.94 for canopy height. Figure 2. 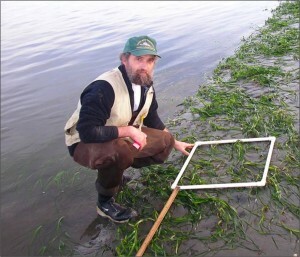 Scientist using a quadrat and meter stick to estimate percent cover, density, and canopy height of a Coos estuary eelgrass meadow. In 2007, the Western Ecology Division of USEPA published a report detailing the intertidal vegetation communities in North American west coast estuaries (Nelson et al. 2007). They collected data from 217 sites in Oregon, Washington, and California, with almost half of their observations in Oregon (65 sites statewide) coming from the Coos estuary (30 sites locally). 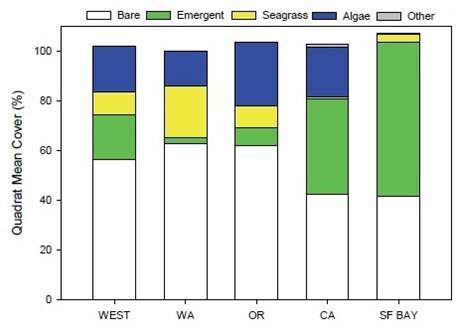 Their results suggest that algae represent a significant percentage of vegetative cover in Oregon estuaries (Figure 4). The intertidal sandflats and mudflats of the lower Coos estuary host a variety of benthic algae that accumulate to form mats in mid-to-high intertidal habitats (Rumrill 2006)(Figure 5). 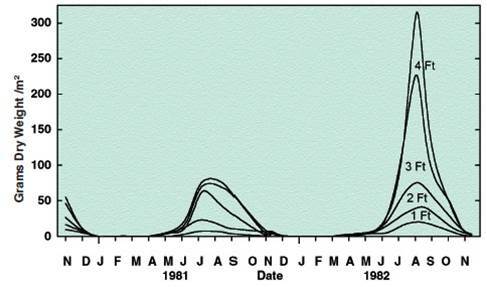 The seasonal production of green algae appears to vary substantially from year to year (Hodder 1986). However, green algae, including sea lettuce (Ulva spp.) and green string lettuce (Entermorpha spp. ), consistently contribute a substantial amount of biomass of the tideflat community during summer months (Figures 6 and 7). Historically, green algae have been abundant on the Coos estuary’s tidal flats (Sandborn and Dotty 1944, Pregnall 1983, Hodder 1986). Its continued presence suggests that it is an established and persistent member of the local intertidal community rather than an opportunitistic species that may be indicative of excess nutrients or pollution (Rumrill 2006). Figure 7. Sea lettuce (Ulva spp.) and other green algae dominate the intertidal flats during the summer months. This seasonal phenomenon is apparent in the photo above of a volunteer helping to conduct early summertime fieldwork in South Slough. Seasonal growth patterns in intertidal and shallow subtidal vegetation reflect the rhythm of naturally occurring changes in the Coos estuary. In the summer (April-September), increased photoperiod, warming of intertidal flats, and an influx of nutrients from coastal upwelling work together to stimulate plant growth (Pregnall 1983, Hodder 1986, Rumrill 2006). In the winter, reduced photoperiod, colder temperatures, and substantial variation in salinity due to seasonal precipitation limit seagrass production and distribution (Lee II and Brown 2009). In general, the spatial cover and density of eelgrass meadows can vary substantially over time; this growth change is determined by natural (e.g., waves and current) and human-induced (e.g., increased nutrient levels and decreased water clarity) factors (Cornu et al. 2012, Hodder 1986). The physical characteristics of an estuary are another important determinant of eelgrass growth. Lee II and Brown (2009) explain that the wide expanses of marine-dominated tide flats provide ample opportunity for eelgrass recruitment in estuaries with strong tidal influences such as the Coos estuary. However, modifications to the physical characteristics of intertidal habitat may affect the ability of eelgrass meadows to persist over time. For example, oyster culture in the Coos estuary is associated with significant decreases in eelgrass abundance in the area immediately surrounding the operation (Everett et al. 1995, Pregnall 1993). Similarly, in Florida freshwater diversions into estuaries appear to decrease seagrass productivity (Estevez 2000). The persistence of eelgrass meadows is also vulnerable to naturally-occurring changes to intertidal flats (e.g., channel migration)(Cornu et al. 2012). The effects of summertime algae blooms (e.g., Ulva spp.) on eelgrass are a matter of some debate. Although some research suggests that sufficiently large algal mats in more freshwater habitats can have potentially toxic effects on seagrasses (Krause-Jensen et al. 1996, Hauxwell et al. 1998, Hessing-Lewis et al. 2011), it appears that these same interactions may result in neutral or even positive consequences in marine-dominated habitats (Hessing-Lewis et al. 2011). For example, because algal mats provide cover and retain moisture during periods of low tide exposure, algae have been shown to alleviate temperature stress in eelgrass, preventing plants from drying out (Boese et al. 2005). 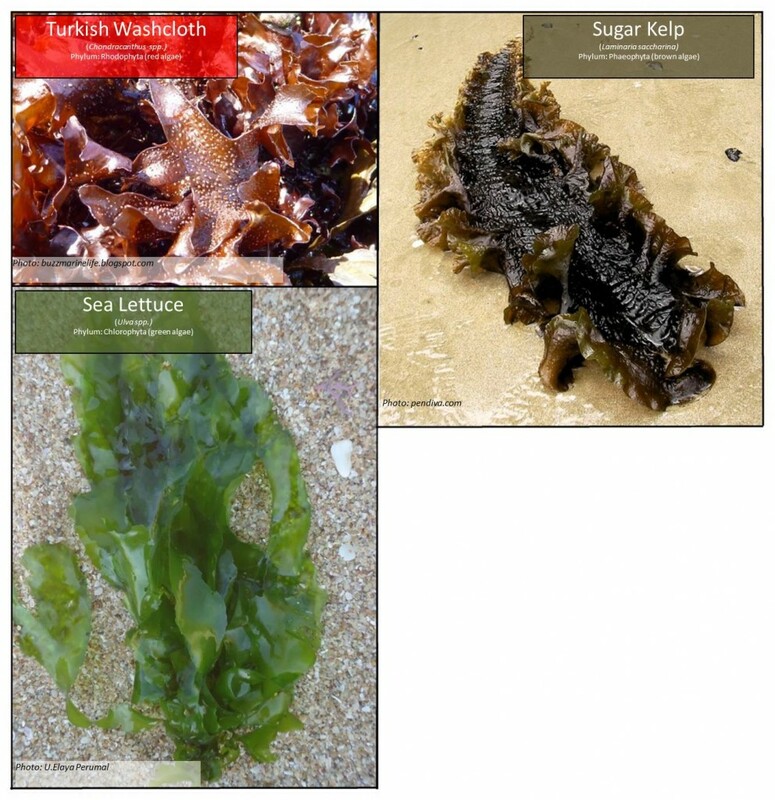 The seaweeds and algae found along the Pacific coast are commonly divided into three groups: red, green, and brown algae (Dreuhl 2000)(Figure 9). Although algae share many of the basic characteristics of plants (e.g., photosynthesis, cell walls that provide rigidity, and generally not overtly sensitive to external stimuli), they lack some of the more advanced features (e.g., flowers, cones or enclosed reproductive systems, extraction of nutrients through roots, and protective bark or waxy coverings)(Dreuhl 2000). Algae constitute a major portion of primary production and an important food source for filter-feeders and deposit-feeders on the tideflats of Pacific Northwest estuaries (Simenstad 1983). In addition to their importance to intertidal benthic communities, estuarine algae have been shown to provide nursery habitat for organisms that use the lower estuary during only a portion of their life cycle (e.g., salmon and other fishes)(Aitkin 1998, Nordby 1982, Emmett et al. 1991, Dreuhl 2000). Dead algae adrift in the open ocean are known to be food sources for marine organisms, and, as a consequence, the production of algae in estuaries affects the function of marine ecosystems (Valtysson n.d.). In addition to serving an important ecological function, algae are used as food for human consumption, industrial chemicals, fertilizers, livestock feed supplements, and in pharmaceuticals (Dreuhl 2000). Similar to eelgrass, algae are considered “bioindicators,” because algal blooms can indicate “eutrophication” in estuaries, a condition caused by excessive nutrients that may result in decreased light availability, low oxygen in estuarine waters and sediments, and reduced growth of submerged aquatic vegetation such as eelgrass (Lee II and Brown 2009, Rumrill 2006, Cornu et al. 2012). The presence of algae alone, however, is not necessarily indicative of eutrophication. Rumrill (2006) explains that the chronic summertime persistence of green algae in the Coos estuary suggests that these species are simply established members of a healthy and functioning tidal flat community. Figure 5. Annual pattern of green algal mat standing crop within the South Slough Subsystem. The uppermost line indicates mean value for the entire site, and the inner delineations represent relative contributions from five tidal elevations (+4, +3, +2, +1 ft. above MLLW) Figure and caption: Rumrill 2008 adapted from Pregnall 1983. Figure 6. Changes in species composition of green algal mats sampled in the South Slough Subsystem during the growing season of 1982. Figure and caption: Rumrill 2008 adapted from Pregnall 1983. Eelgrass is a marine “angiosperm” (i.e., flowering plant) that produces seeds in the summer months and new roots and rhizomes in the winter (Rumrill 2008). It differs from other aquatic plants because of its preference for submerged habitats, its ability to reproduce underwater, and its high salt tolerance (Cornu et al. 2012). Optimal eelgrass growth occurs in high salinity environments (i.e., 10-30), with seed germination occurring most frequently in brackish water (i.e., 5-10)(Phillips 1972, Phillips et al. 1983). Although it can tolerate periodic immersion in freshwater, it cannot persist in freshwater environments (Rumrill 2006). 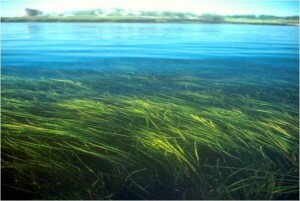 Although eelgrass only grows sporadically in patches of 1-3m2 in the brackish areas of the upper Coos estuary, it forms expansive meadows in the marine-dominated portions of the estuary. These meadows are important intertidal habitats that contribute organic matter to the estuarine food web (Rumrill 2006). They also serve many important ecological functions such as sediment stabilization, nutrient processing, trapping of detritus, and provision of important habitat for many species of estuarine animals (especially for juvenile finfish and shellfish) that are commercially, recreationally and ecologically valuable (Cornu et al. 2012, Phillips 1984, Rumrill 2006)(Figure 8). Due to the vital niche that eelgrass meadows fill in estuarine systems, the health of these communities is widely considered to be indicative the overall health of an estuary (Bricker et al. 1999, Cornu et al. 2012, Dennison et al. 1993). Unfortunately, seagrasses are in decline in estuaries and coastal areas all over the world due to both human-induced and natural disturbances, including the following: coastal uplifting, coastal erosion, winter storms and hurricanes, grazing, naturally occurring sediment disturbances, disease, sediment and nutrient loading from human activity, mechanical damage from dredging and filling, aquaculture practices, commercial fish trawling and dragging, and contaminated sediments and water from heavy metals and/or other toxic compounds (Cornu et al. 2012, Short and Wyllie-Echeverria 1996). In a review of over 200 seagrass studies, Waycott et al. (2009) found that the decline of seagrasses has been documented as early as 1879. They estimate that nearly a third of all seagrass meadows across the globe have been lost, with rates of decline accelerating markedly since 1990. They add that seagrass meadows are among the most threated ecosystems on earth. The alarming rate of their global decline is comparable to some of the most extensive habitat losses worldwide (e.g., mangroves, coral reefs, and tropical rainforests). Figure 9. The term “seaweed” is a colloquialism describing a diverse assemblage of algae species with unique taxonomies (Druehl 2000). Algae are commonly classified into three broad phyla, which are often referred to by the color of their pigments (red, green, and brown). Three algae from each group commonly found on the Oregon coast are pictured above. Aitkin, Kevin J. 1998. The Importance of Estuarine Habitats to Anadromous Salmonids of the Pacific Northwest: A Literature Review. [Technical report for the United States Fish and Wildlife Service]. Accessed 16 April 2015 from http://www.fws.gov/wafwo/fisheries/Publications/FP005.pdf. (USA) estuary. Botanica Marina 48:274-283. Bricker, S. B., C. G. Clement, D. E. Pirhalla, S. P. Orlando, and D. R. G. Farrow. 1999. National Estuarine Eutrophication Assessment: Effects of Nutrient Enrichment in the Nation’s Estuaries. 71 pp. NOAA, National Ocean Service, Special Projects Office and the National Centers for Coastal Ocean Science, Silver Spring, MD. Cornu, C.E., J. Souder, J. Hamilton, A. Helms, R. Rimler, B. Joyce, F. Reasor, T. Pedersen, E. Wright, R. Namitz, J. Bragg, and B. Tanner. 2012. Partnership for Coastal Watersheds State of the South Slough and Coastal Frontal Watershed. Report prepared for the Partnership for Coastal Watersheds Steering Committee. South Slough National Estuarine Research Reserve and Coos Watershed Associations. 225 pp. Dennison, W. C., R. J. Orth, K. A. Moore, J. C. Stevenson, V. Carter, S. Kollar, P. W. Bergstrom, and R. A. Batiuk. 1993. Assessing water quality with submersed aquatic vegetation. BioScience 43(2):86-94. Druehl, L. 2000. Pacific Seaweeds. Madiera Park, British Columbia: Habour Publishing. Emmett, R. L., S. A. Hinton, S. L. Stone, and M. E. Monaco. 1991. Distribution and abundance of fishes and invertebrates in west coast estuaries Volume II. Species life history summaries. ELMR Report No. 8. National Oceanic and Atmospheric Administration, National Ocean Service, Rockville, MD. 329 pp. Everett, R., G. Ruiz, and J. Carlton. 1995. Effect of oyster mariculture on submerged aquatic vegetation: an experimental test in a Pacific Northwest estuary. Marine Ecology Progress Series 125: 205-221. Hauxwell, J., J. McClelland, P. J. Behr, and I. Valiela. 1998. Relative importance of grazing and nutrient controls of macroalgal biomass in three temperate shallow estuaries. Estuaries 21(2):347-360. Hessing-Lewis, Margot L., Sally D. Hacker, Bruce A. Menge, and Steve S. Rumrill. 2011. Context-Dependent Eelgrass-Macroalgae Interactions Along an Estuarine Gradient in the Pacific Northwest, USA. Estuaries and Coasts 34:1169-1181. Hodder, J. 1986. Production biology of an estuarine population of the green alga, Ulva spp. in Coos Bay, Oregon. Ph.D. thesis, University of Oregon. 106 pp. Krause-Jenson, D., K. Glathery, S. Rysgaard, and P. B. Christense. 1996. Production within dense mats of the filamentous macroalga Chaetomorpha linum in relation to light and nutrient availability. Marine Ecology Progress Series 134: 207-216. Lee II, H. and C. A. Brown. (eds.) 2009. Classification of Regional Patterns of Environmental Drivers and Benthic Habitats in Pacific Northwest Estuaries. U.S. EPA, Office of Research and Development, National Health and Environmental Effects Research Laboratory, Western Ecology Division. EPA/600/R-09/140. National Geophysical Data Center of the National Oceanic and Atmospheric Administration (NGDC). 2014. National Multi-beam Bathymetry Survey Shapefiles. Accessed 14 April 2015 from http://www.arcgis.com/home/item.html?id=70a5eba1fcff49b682590288d340b38e. Nelson, Walter G., Henry Lee II, Janet O. Lamberson, Faith A. Cole, Christine L. Weiloefer, and Patrick J. Clinton. 2007. The Condition of Tidal Wetlands of Wasthington, Oregon, and California – 2002. Office of Research and Development, National Health and Environmental Effects Research Laboratory, EPA/620/R-07/002. Nordby, C. S. 1982. The comparative ecology of ichthyoplankton within Tijuana estuary and its adjacent nearshore waters. Master’s thesis, San Diego State University. 101 pp. Phillips, R. C. 1972. Ecological life history of Zostera marina L. (eelgrass) in Puget Sound, WA. Ph.D. thesis, University of Washington. 154 pp. Phillips, R. C., C. McMillan, and K. W. Bridges. 1983. Phenology of eelgrass, Zostera marina L., along latitudinal gradients in North America. Aquatic Botany 15: 145-156. Phillips, R. C. 1984. 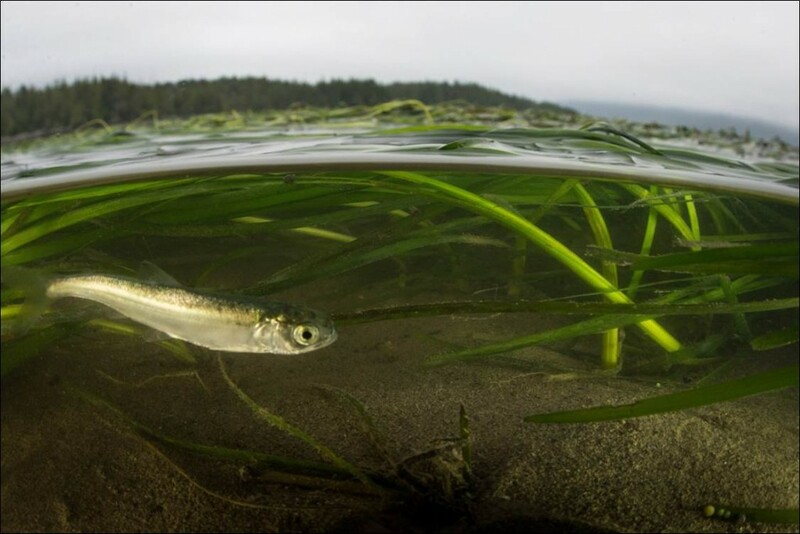 The ecology of eelgrass meadows in the Pacific Northwest: a community profile. U.S. Fish Wildlife Service FWS/OBS-84/24. 85 pp. Pregnall, A. M. 1983. Production ecology of green macroalgal mats (Enteromorpha spp.) in the Coos Bay, Oregon estuary. Ph.D. thesis, University of Oregon. 145 p.
Pregnall, M. M. 1993. Regrowth and recruitment of eelgrass (Zostera marina) and recovery of benthic community structure in areas disturbed by commercial oyster culture in the South Slough National Estuarine Research Reserve, Oregon. Master’s thesis, Bard College. 90 pp. Rumrill, S. S. 2006. The Ecology of the South Slough Estuary: Site Profile of the South Slough National Estuarine Research Reserve. Salem, Oregon: NOAA, Oregon Department of State Lands Technical Report, 238p. Rumrill, S. 2008. Ecology of the South Slough Estuary– Site profile of the South Slough National Estuarine Research Reserve. Rumrill, Steven S. and Derek C. Sowers. 2008. 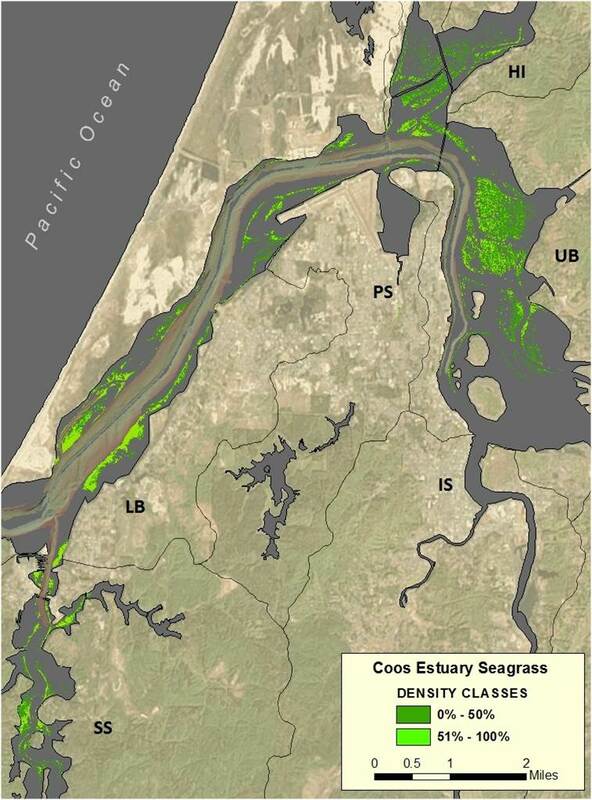 Concurrent Assessment of Eelgrass Beds (Zostera marina) and Salt Marsh Communities along the Estuarine Gradient of the South Slough, Oregon. Journal of Coastal Research. 55: 121-134. Sanborn, E. I. and M. S. Doty. 1944. The marine algae of the Coos Bay – Cape Arago region of Oregon. Corvallis, OR: Oregon State University (Collection Records). 23 pp. Short, F. T. and S. Wyllie-Echeverria. 1996. Natural and human-induced disturbance of seagrasses. Environmental conservation, 23(01), 17-27. Simenstad, C. A. 1983. The ecology of estuarine channels of the Pacific Northwest coast: a community profile. U.S. Fish and Wildlife Service FWS/OBS-83/05. 181 pp. South Slough National Estuarine Research Reserve (SSNERR). 2015. SeagrassNet eelgrass Monitoring Raw Data. [Unpublished data]. Accessed at the Estuarine and Coastal Sciences Laboratory of SSNERR 15 April 2015. Valtysson, Hreidar Por. n.d. Benthic Algae. [Unpublished article of the Information center of the Icelandic Ministry of Fisheries and Agriculture]. Accessed 16 April 2015 from http://www.fisheries.is/ecosystem/marine-life/benthic-algae/. Waycott, M., C. M. Duarte, T. J. Carruthers, R. J. Orth, W. C. Dennison, S. Olyarnik, and S. L. Williams. 2009. Accelerating loss of seagrasses across the globe threatens coastal ecosystems. Proceedings of the National Academy of Sciences, 106(30), 12377-12381. Wyllie-Echeverria, S. and J. D. Ackerman. 2003. The seagrasses of the Pacific Coast of North America. pp. 199-206. In E.P. Green and F.T. Short (eds.) World Atlas of Seagrasses: present status and future conservation. Prepared by the UNEP World Conservation Monitoring Centre. University of California Press, Berkley, CA. 298 p.